Indian Smartphone Market Clocks 124 million units in 2017! 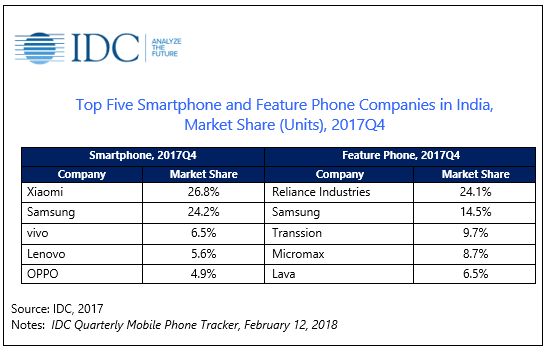 Samsung holds on to its #1 position both in smartphone and feature phone market; However, 2017 Q4 shows Xiaomi and Reliance Jio dethroning Samsung from #1 position in the smartphone and feature phone segment respectively. As revealed by International Data Corporation’s (IDC) Quarterly Mobile Phone Tracker, Indian smartphone market has achieved a 14 percent annual growth with a total shipment of 124 million units in 2017. This qualifies India as the fastest growing market amongst the top 20 smartphone markets globally. The market has revived from the 2016 slowdown, as caused by factors like demonetisation and the shortage of smartphone components. On the contrary, China, world’s largest smartphone market experienced its first decline this year, while the USA was relatively flat. China-based OEMs further strengthened their positions in the smartphone category with their collective share reaching 53 percent in 2017 from 34 percent a year ago. “Untapped demand in the lower-tier cities remains the key attraction for China-based brands to explore the growth trajectory in India. Their strength in their home market of China and weakening position of local players has helped some of these China-based players to solidify their operations in India,” says Jaipal Singh, Senior Market Analyst, IDC India. 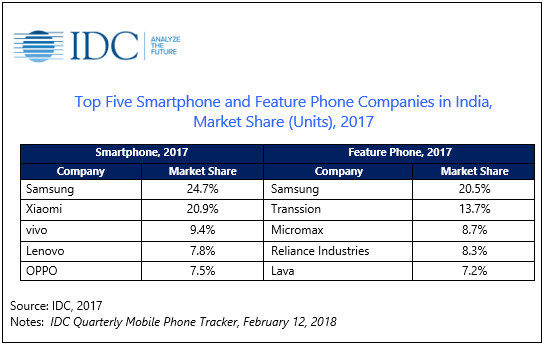 India is the world’s third-largest smartphone market, and also continues to hold its position of being the biggest feature phone market globally. 2017 has witnessed a 17 percent annual growth after declining for three consecutive years. While feature phones remain relevant to a large consumer base in India, the Indian telecom operator Reliance Jio shipped huge shipments of 4G enabled feature phones taking the leadership position on its maiden quarter in this category. This resulted in a total of 164 million feature phone shipments in 2017 from 140 million a year ago. In 2017Q4, vendors shipped a total of 56 million units in the 2017Q4 making it the highest-ever shipments in a single quarter. The category registered a huge 67 percent year-over-year (YoY) growth and 33 percent growth from the previous quarter. With the competitive landscape is becoming more challenging in India, the low smartphone penetration remains a major attraction for all OEMs. They are making serious attempts to address the problem of affordability in India with the introduction of more affordable products, resulting in initiatives such as Android Oreo ‘Go edition’, telco bundling with low-cost 4G smartphones and even the 4G feature phone Jio Phone. As consumers experience and get hooked on to data, their need to be on a digital platform will go up and smartphones will be the first platform for many of them. IDC expects the Indian smartphone market to continue double-digit growth for next couple of years. "Indian Smartphone Market Clocks 124 million units in 2017; Grows By 14%! ", 2 out of 5 based on 3 ratings. Intercity Trains Will Now Run At 250 kph Speed; Railways Will Recruit 90,000 Staff!